Good to see the LGBT colours projected onto Covent Garden’s famous curtain, this being Pride Parade day, before this production of Verdi’s Falstaff. 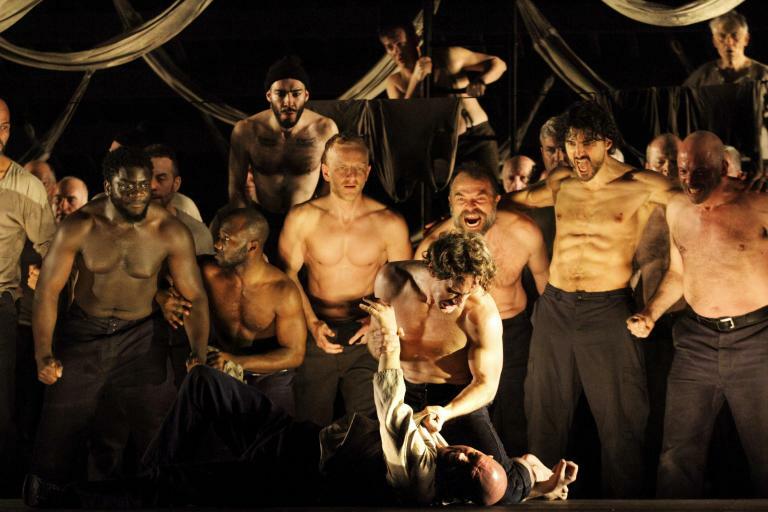 This is the third outing for Robert Carsen’s vision of Verdi’s late masterpiece: I reviewed the 2015 revival of Robert Carsen’s production (click here) while my colleague Jim Pritchard reviewed the 2012 first staging (click here). Also worth pointing out – since this review rains hyperlinks – is Seen and Heard International’s review of Falstaff in San Francisco, as it not only featured Sir Bryn but also the conductor Nicola Luisotti (albeit in Olivier Tambosi’s production: click here). The Covent Garden production remains, obviously, in Windsor in the 1950s. The Merry Wives, Hausfrauen all, the brown wood paneling, the live (uncredited) horse, all remain. After the dissonance between staging and music in the recent Glyndebourne Pelléas, it is somewhat daunting to feel a divide once more, if not quite so pronounced. The masticating live horse (there is hay provided) remains impossible to ignore, no matter how impressive the singing, upstaging Sir Bryn in Act III Scene 1. Verdi’s fizz is flattened somewhat, visually, despite the cleverness of the characters’ fugue entrances coinciding with their coming to the end of walking the long dining table at the end; and by that brown of the walls. The good news is that Nicola Luisotti’s conducting was intelligent – if admittedly not overly highly-powered – although there was the odd ensemble problem on the opening night (chorus and orchestra parting company to a degree on one occasion). Sir Bryn Terfel is Falstaff incarnate; this is a role he envelops, devours, and makes his own. The sheer verve, and the comedic timing, are relishable. We absolutely believe that Falstaff could indeed cavort about in those disgustingly soiled clothes. In fine vocal fettle, exhibiting myriad vocal shadings, and with more energy than a dozen horses, this was a near-perfect assumption, far from mono-dimensional. Terfel’s ‘Quand’ero paggio’ and ‘Va, vecchio John’ were just two moments of total congruence between interpreter and role. And Sir Bryn was not the only knight on stage, for there were two Sir Baritones: it is now Sir Simon Keenlyside, a richly deserved recognition. Keenlyside owned the role of Ford/Brook; how he must have loved the bling as Brook. His solo outpouring of jealousy, too, was palpable. The female roles in this opera are deliciously varied, and the singers chosen for this evening made for a strong team. Marie-Nicole Lemieux was brilliantly funny as Mistress Quickly (the 2012 run marked her Covent Garden debut), Marie McLaughlin a light Meg Page, replacing the previously advertised Pamela Helen Stephen. Ana María Martínez, the fine Puerto Rican soprano (who impressed in Donizetti’s Poliuto at Glyndebourne in 2015 in the role of Paolina) was a strong, full-voiced Alice Ford. Most delightful of all was the combination of Anna Prohaska’s utterly charming and vocally fresh Nannetta and Canadian tenor Frédéric Antoun’s Fenton, a sweet pair of lovers. With Carlo Bosi’s Dr Caius and Michael Colvin’s Bardolph upping the fun and with American bass-baritone Craig Colclough making a highly creditable Royal Opera debut as Pistol (he is better known across the road at ENO in heavier roles such as Kurwenal, Jack Rance and Scarpia), this is a strong cast. Lighting, by Carlsen and Peter van Praet, is particularly well done, particularly in the use of solo spotlighting, but also in conjuring the magic of Windsor Great Park. The sense of disjunction in the 1950s setting is admittedly less pronounced than the relocation of Debussy’s opera to Glyndebourne’s Organ Room and is certainly no reason to stay away. Go, and be reminded of Verdi’s genius; and to see Terfel’s remarkable Falstaff.